Acetaminophen, the amphiphilic acids acetylsalicylic acid (ASA), ibuprofen, and others, as well as some pyrazolone derivatives, such as aminopyrine and dipyrone, are grouped under the label antipyretic analgesics to distinguish them from opioid analgesics, because they share the ability to reduce fever. Acetaminophen (paracetamol) has good analgesic efficacy in toothaches and headaches, but is of little use in inflammatory and visceral pain. 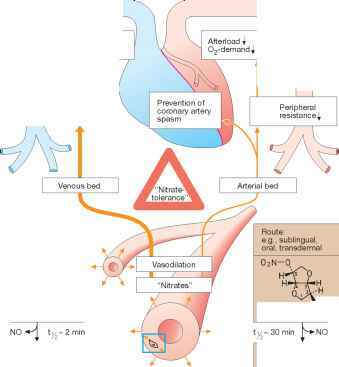 Its mechanism of action remains unclear. It can be administered orally or in the form of rectal suppositories (single dose, 0.5-1.0 g). The effect develops after about 30 min and lasts for approx. 3 h. Acetaminophen undergoes conjugation to glucuronic acid or sulfate at the phenolic hydroxyl group, with subsequent renal elimination of the conjugate. At therapeutic dosage, a small fraction is oxidized to the highly reactive N-acetyl-p-benzoquinonimine, which is detoxified by coupling to glutathione. After ingestion of high doses (approx. 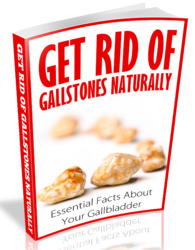 10 g), the glutathione reserves of the liver are depleted and the quinonimine reacts with constituents of liver cells. As a result, the cells are destroyed: liver necrosis. Liver damage can be avoided if the thiol group donor, N-acetylcysteine, is given intravenously within 6-8 h after ingestion of an excessive dose of acetaminophen. Whether chronic regular intake of acetaminophen leads to impaired renal function remains a matter of debate. Acetylsalicylic acid (ASA) exerts an antiinflammatory effect, in addition to its analgesic and antipyretic actions. These can be attributed to inhibition of cyclooxygenase (p. 196). ASA can be given in tablet form, as effervescent powder, or injected systemically as lysinate (analgesic or antipyretic single dose, 0.5-1.0 g). 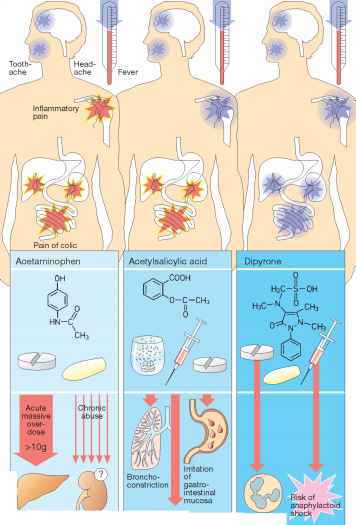 ASA undergoes rapid ester hydrolysis, first in the gut and subsequently in the blood. The effect outlasts the presence of ASA in plasma (ti/2 ~ 20 min), because cyclooxygenases are irreversibly inhibited due to covalent binding of the acetyl residue. Hence, the duration of the effect depends on the rate of enzyme resynthesis. Furthermore, salicylate may contribute to the effect. ASA irritates the gastric mucosa (direct acid effect and inhibition of cy-toprotective PG synthesis, p. 200) and can precipitate bronchoconstriction ("aspirin asthma," pseudoallergy) due to inhibition of PGE2 synthesis and overproduction of leukotrienes. Because ASA inhibits platelet aggregation and prolongs bleeding time (p. 150), it should not be used in patients with impaired blood coagulability. Caution is also needed in children and juveniles because of Reye's syndrome. The latter has been observed in association with febrile viral infections and ingestion of ASA; its prognosis is poor (liver and brain damage). Administration of ASA at the end of pregnancy may result in prolonged labor, bleeding tendency in mother and infant, and premature closure of the ductus arteriosus. Acidic nonsteroidal antiinflammatory drugs (NSAIDS; p. 200) are derived from ASA. Among antipyretic analgesics, di-pyrone (metamizole) displays the highest efficacy. It is also effective in visceral pain. Its mode of action is unclear, but probably differs from that of acetaminophen and ASA. It is rapidly absorbed when given via the oral or rectal route. Because of its water solubility, it is also available for injection. Its active metabolite, 4-aminophenazone, is eliminated from plasma with a ti/2 of approx. 5 h. Dipyrone is associated with a low incidence of fatal agranulocytosis. In sensitized subjects, cardiovascular collapse can occur, especially after intravenous injection. Therefore, the drug should be restricted to the management of pain refractory to other analgesics. Propy-phenazone presumably acts like meta-mizole both pharmacologically and tox-icologically. What are the adverse effect of opoid & nonopoid drugs of analgesic and antipyretic?